Before you dispose of the oil left over from an oil change in a car, a boat motor, a motorcycle, or even a chainsaw, remember that it can be recycled and refined over and over again, and still be used for a variety of purposes. Used motor oil recycling is the law in most cities and states. Though the federal government doesn't regulate used motor oil as a hazardous waste, some states do because of the environmental risks and health hazards that oil presents. Once oil gets into a drinking water supply, for example, it's very difficult, time-consuming and expensive to remove. The Environmental Protection Agency estimates that the oil from just one oil change could contaminate 1 million gallons of water. Major companies also encourage oil recycling, if only because it's better for their bottom line: while it takes about 42 gallons of crude oil to produce 2.5 quarts of motor oil, it takes just one gallon of used motor oil to be refined into the same amount of "new" motor oil. After it's been re-recycled or re-refined, motor oil can be converted for use as fuel in such things as space heaters or in industrial blast furnaces. There's even a process that can re-refine it so it can be used as diesel or marine oil. No matter how often it's recycled or refined, motor oil retains its lubrication properties. If you're a do-it-yourself mechanic, you probably already know how to maintain your car, including changing the oil. Store your used motor oil in a clean, leak-proof container like a plastic milk jug or an empty oil bottle. Make sure the cap is tightly sealed on the container, and store it in a cool, dry place away from heat, sunlight, kids, and pets. Many auto parts stores also sell drip pans that double as used oil receptacles. 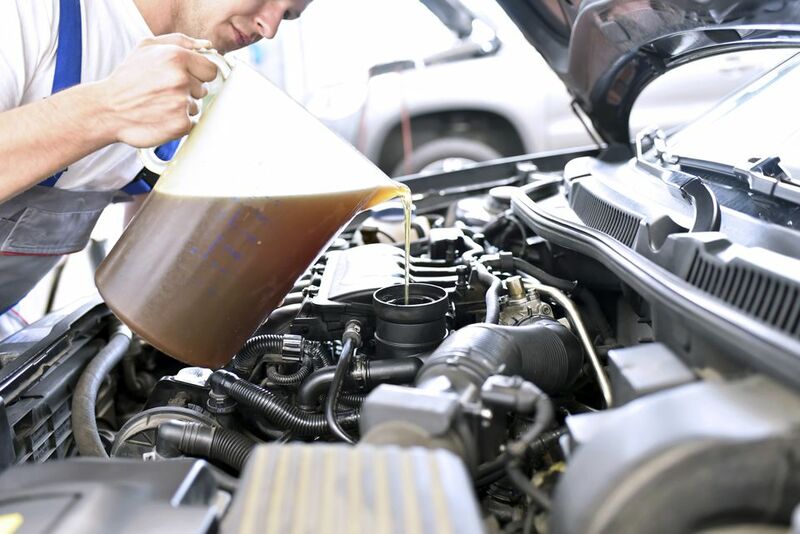 Used motor oil can't be recycled if it's mixed with other liquids like antifreeze or brake fluid, so keep your vehicle's other liquids separated. Oil filters can be recycled, too, and most states won't allow you to toss an undrained oil filter in the trash. If you have a used oil filter, use a screwdriver or other tool to puncture a hole in the dome end of the filter, ideally while it's still warm. Allow the oil filter to drain into the used oil container for several hours. Now that you've got your used motor oil and your oil filter, where do you take it? Fortunately, many auto parts stores and some service stations will accept used motor oil and oil filters for recycling. Call ahead to find out what your local shop will accept. If you're stuck, try the Earth911.com to find a service station or recycling center near you. Note that not all places that accept used motor oil will also accept used oil filters, so call ahead and make sure of who accepts what.